When the Wanderers run out tonight in a stadium not fit for purpose, it will sum up just how far Sydney has fallen as a sporting city since the 2000 Olympics. New South Wales’ latest Labor leader, Michael Daley, said during the week that if his party wins the state election in March, they would not rebuild either Allianz Stadium at Moore Park or upgrade ANZ Stadium in Homebush. 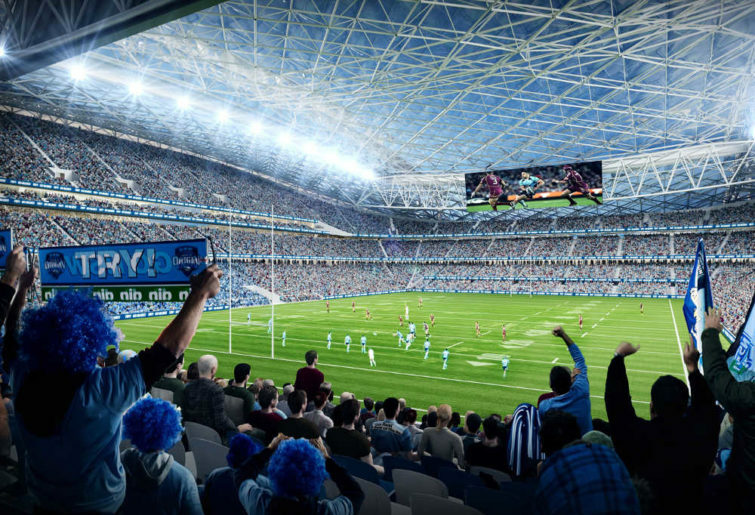 That’s despite the fact that, by the time the election rolls around, Allianz Stadium’s demolition will have begun, and it’s already sent major tenant Sydney FC on a peripatetic journey across the city’s suburbs. Daley says his party will spend the entirety of the $1.5 billion earmarked for stadium upgrades by Gladys Berejiklian’s state government on hospitals and public schools instead. Depending on your point of view, it’s either a bold move spurred on by the public outcry over the high cost of the stadium rebuilds, or a blatant act of political grandstanding. It also makes Sydney a laughing stock in the eyes of every other city in Australia. But then, it doesn’t seem like the Harbour City needs much help in that department. This is a city in which you can’t buy a normal train ticket from the airport, can’t buy a drink after midnight and can’t afford to buy a house anywhere. It’s a city that has closed down venues by the dozens, forced out musicians and artists and low-income and creative types by the thousands and made millions for property developers at the expense of its long-suffering public. How about installing a light rail network without disrupting the city for years? Not possible in a joint like Sydney. So why should we expect them to be able to do something that cities like Adelaide and Perth have done with a minimum of fuss, and either upgrade or build new stadia that bring plenty of tourists to town? All of this electioneering leaves clubs like Western Sydney and Sydney FC in a bind. The Wanderers, at least, will soon have a brand new Western Sydney Stadium to move into – the naming rights of which were just awarded to a bank from Western Australia. Sydney FC, meanwhile, attracted crowds of 40,000+ to no less than six of their derbies against the Wanderers at Allianz Stadium – not to mention selling out the 2017 A-League grand final – yet their name rarely features in mainstream media discussions around Sydney’s stadium wars. Anyone who attended those games at Allianz Stadium knows the ground was no longer suitable to host matches of that magnitude – the narrow, dimly-lit concourses funnelled thousands of fans into the same choke points at the exits. It was never a problem until clubs like Sydney FC and the Wanderers came along because, frankly, the ground’s other tenants rarely drew crowds large enough for it to be one. And the only thing Daley’s announcement will do is send the NRL grand final north to Suncorp Stadium in Brisbane – and potentially a few key Socceroos and Matildas games while he’s at it. Meanwhile, Melbourne’s mantle as the sporting capital of Australia isn’t exactly under threat. By a stroke of coincidence, I’ll be in Sydney this weekend because – among other things – I’ve got tickets to see Wu-Tang Clan at the Sydney Opera House. Having been born and raised in the Harbour City, I used to be proud to call Sydney home – but I was priced out of the city years ago, like a lot of folks my age. So I’ll fly into Sydney to enjoy its sights and sounds for a few nights, before hopping on a plane and flying back to somewhere a bit more hospitable. If only the Western Sydney Wanderers and Sydney FC had that option. After last week’s Spotless Stadium debacle, the news that one of the city’s key venues may not be rebuilt – despite the fact its demolition is looming – just about seals Sydney’s reputation as the most embarrassing sporting city in Australia. Note: This article originally stated the demolition of Allianz Stadium has begun. This was incorrect, and has now been amended.